Bryant: What leadership lessons have you learned from your predecessor, Steve Ballmer? I went on to ask him, “How do I compare to the people who had my role before me?” And Steve said: “Who cares? The context is so different. The only thing that matters to me is what you do with the cards you’ve been dealt now. I want you to stay focused on that, versus trying to do this comparative benchmark.” The lesson was that you have to stay grounded, and to be brutally honest with yourself on where you stand. Bryant: And what about Bill Gates? 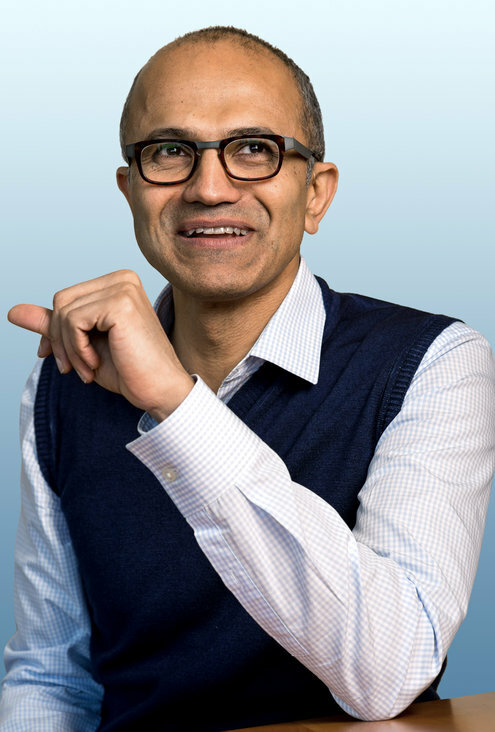 Nadella: Bill is the most analytically rigorous person. He’s always very well prepared, and in the first five seconds of a meeting he’ll find some logical flaw in something I’ve shown him. I’ll wonder, how can it be that I pour in all this energy and still I didn’t see something? In the beginning, I used to say, “I’m really intimidated by him.” But he’s actually quite grounded. You can push back on him. He’ll argue with you vigorously for a couple of minutes, and then he’ll be the first person to say, “Oh, you’re right.” Both Bill and Steve share this. They pressure-test you. They test your conviction. Bryant: There’s a lot of curiosity around what kind of role Bill is going to play with you. Nadella: The outside world looks at it and says, “Whoa, this is some new thing.” But we’ve worked closely for about nine years now. So I’m very comfortable with this, and I asked for a real allocation of his time. He is in fact making some pretty hard trade-offs to say, “O.K., I’ll put more energy into this.” And one of the fantastic things that only Bill can do inside this campus is to get everybody energized to bring their “A” game. It’s just a gift. Adam Bryant, deputy national editor of The New York Times, oversees coverage of education issues, military affairs, law, and works with reporters in many of the Times’ domestic bureaus. He also conducts interviews with CEOs and other leaders for Corner Office, a weekly feature in the SundayBusiness section and on nytimes.comthat he started in March 2009. In his book, The Corner Office: Indispensable and Unexpected Lessons from CEOs on How to Lead and Succeed, (Times Books), he analyzes the broader lessons that emerge from his interviews with more than 70 leaders. To read an excerpt, please click here.